As if on cue, the sun is finally out. Just in time to send us off on a week of vacationing on the lake. Nothing but sun, swimming, relaxing, eating, sleeping, maybe some thrifting, and a wee bit o’ working. That couldn’t be helped, but at least my “work” involves reading fiction. Not too shabby even on a bad day. So I’ll be away from the computer for a whole week (!) and will miss you all dearly. Farewell. The other farewell is for Aunt Ethel who passed away today. 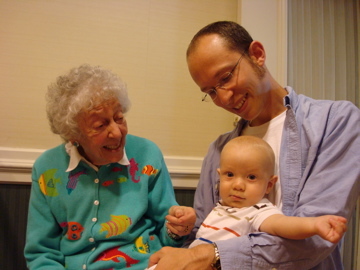 Aunt Ethel, Neil, and Dash (at about six months) last year. Ethel and Dash had a real bond due to baby talk being the major form of communication for both of them. You will be missed Ethel. This entry was posted on Friday, August 15th, 2008 at 4:41 pm	and is filed under Misc.. You can follow any responses to this entry through the RSS 2.0 feed. You can leave a response, or trackback from your own site. Miss you already! Sorry to hear about your Ethel. We lost an Ethel this year, my husband’s Gram.